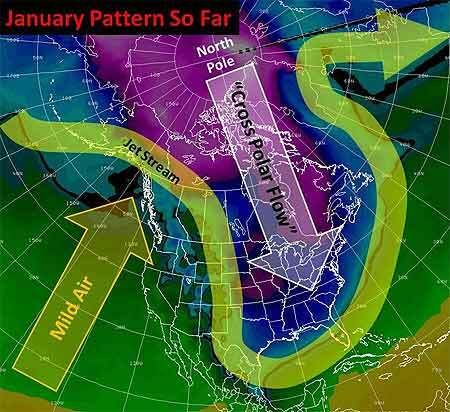 Well, the big winter cold snap that has been gripping much of the United States since December is nearing its end. Temperatures in most places from the Plains to the East Coast have started to rebound and no renewed surges of Arctic air are on the horizon after a final weak front moves through the East Tuesday. But the damage is done in places from the Dakotas and Montana to Florida: burst pipes, roads that drifted shut, and wind chills lower than -50 in the North, and car crashes on icy roads, power outages, and record cold that has chilled the South. Snow and icy winds whipped southward from the Midwest into Tennessee, Georgia, and Alabama late in the week, making travel a disaster in Memphis and Atlanta. Video of cars sliding off roads or into each other played every half hour on The Weather Channel into the weekend. Clearing led to record morning lows both Sunday and Monday that threatened harm to Florida’s $3 billion citrus industry. Temperatures bottomed out at 25° in Tampa, 29° in Orlando, and 31° in Ft. Myers. On Sunday, the temperature in Miami tied the 1970 record for the date with 35°, and a 36° low Monday morning broke the previous record for the date of 37° set in 1927. Despite the records, it has been the duration of the cold, especially in the South, that makes this cold snap memorable. Morning after morning since the previous weekend, photos of Florida strawberries encased in ice showed up on newscasts. Such protective measures against the frigid temperatures are expected for several more mornings in central Florida, even as the chill slowly moderates. The cold was even long-lasting in the Midwest and Plains, as noted in TWC meteorologist Tim Ballisty’s article “It’s Cold But So What?” last week. He points out that Chicago hasn’t been above freezing since Christmas Day, at the time 11 straight days and counting. Cleveland had 10 consecutive days of snow, and that count continued right into the weekend. Unlike the extensive heat waves of recent summers, this long and harsh cold snap resulted in relatively few new temperature records. At the Annual Meeting in Atlanta, Gerry Meehl of NCAR will explore the rising ratio of record high temperatures to record low temperatures, which is expected to markedly increase by the middle of the century with current projections of climate warming.